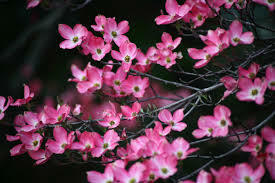 Pink Dogwood Tree For Sale - Lowest Prices Online Today! This flowering tree definitely stands out in my yard with my other trees. It arrived quickly, we planted it, and it is doing great! 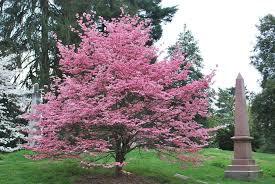 The Pink Dogwood Tree is both a flowering and ornamental deciduous tree that flourishes in Hardiness Zones 5-9. As its name suggests, these blooms are a lavish pink color that peak in the spring months. They are used in landscaping to contrast dark evergreens and are known for their naturally rounded shape. This dogwood has a growth rate of 1-2 feet a year, with an average maturity of 25 feet in height. Because of its ability to grow in acidic, loamy, moist, sandy, well-drained, or clay soils, it is a diverse and vibrant addition to almost any landscape! Pink Dogwood Tree is a garden favorite. Pink Dogwood trees are stunning. The color is so vibrant that when you pass by them, you just have to stop and look. The pretty pink color gets even lighter but then darkens when it ages. In fall the leaves turn fiery red. This will flow great with your landscape as fall approaches. This type of tree does have low branches which are great for all seasons year round. They can be planted in a small yard and also more significant properties as well. They will make your house look fuller, and they can be planted right in the middle of your property if that look appeals to you. Pink Dogwood is a wonderful ornamental tree for a garden. Pink Dogwood will provide beautiful blooms during the spring months and gorgeous green leaves during the summer. The blossoms on this tree will be a pinkish color when in bloom. They will do well in moist soils but can also adapt to other types of soil. The birds love this tree because with the full blooms they feel safe in the tree and feel safe and secure building their home in the branches. Most will make a nest and come back to the same nest each year because they seek its safety. Pink Dogwood Tree an eye-catcher and the showstopper when in full bloom and showing all its glory! Cherokee Princess Dogwood Tree is an excellent choice to add to your landscape. It likes soils that are moist and acidic. It will produce large white flowers during the spring and early summer months of the year. It can even handle some drought and colder weather. Is Native in some parts? These trees are unusual when they are in bloom. The blooms of this tree appear in white during the spring, and they also produce wonderful red berries that the squirrels and birds love to feast on. They can grow great in flower beds and natural areas and work great as ornamental trees. These trees are high and look great as they are in bloom and provides a beautiful delicate color and area on a lawn. They look great when several are planted to line a long driveway or walkway. These can be seen growing a lot along public sidewalks and also along streets and roads. These trees are a great way to bring an exclusive look and also adds lots of curb appeal to a lawn as they are growing and in bloom. They are very popular among homeowners and also landscapers. They work great with creating a beautiful massive landscaping project. 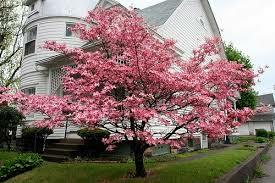 A lovely addition to your spring landscape, the pink dogwood tree can brighten any outdoor space. Whether you have acres of land or want to dress up your patio, it will bloom earlier than most other plants, but its foliage makes it a magnificent beauty throughout the rest of the year. Easy to grow, the pink dogwood is hardy and will flourish in full sun and partial shade. It will also tolerate most types of soil. While these trees can grow up to 25 feet, they begin showing off their pastel blooms when they are only about 3 feet tall.